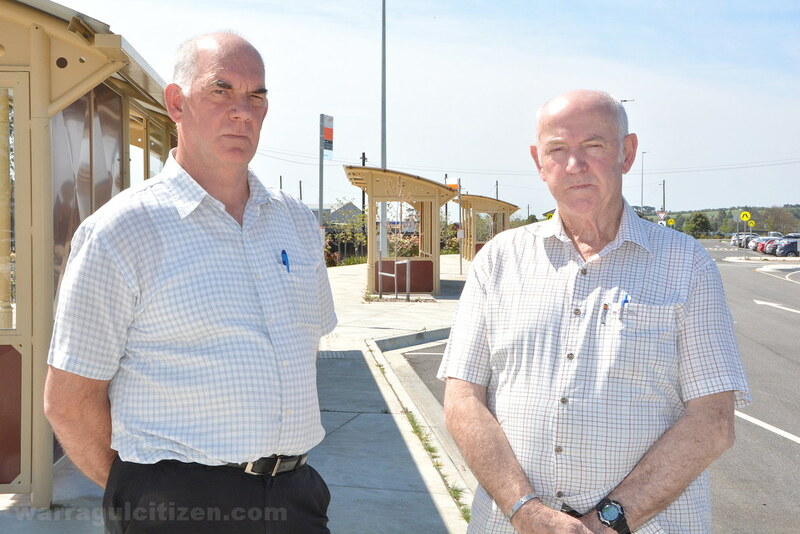 Above: Still waiting: Philip Radford and Jim Chapman at the largely unused Warragul station bus interchange. Photo: William PJ Kulich. Campaigner Jim Chapman last week told media the review presently being undertaken by Public Transport Victoria into regional public transport networks needed to put Warragul first to address a massive shortcoming in bus service delivery. “We’ve got this big bus interchange, I call it a white elephant, sitting up here with 200 car spaces and no buses,” he said. “We’ve been waiting [for expanded services] since [the local service review of] 2010; I think we are entitled to an expansion. Warragul’s bus timetable is limited, running only a small number of services in the late morning and early afternoon, while Drouin is the largest regional Victorian town to have no town service at all. “The response has always been ‘it has been approved. [Local Liberal MP] Gary Blackwood told me that very early in the piece,'” Mr Chapman said. Warragul Bus Lines chief Philip Radford joined Mr Chapman at his media event and told the Warragul & Baw Baw Citizen he was not sure how well bus service shortcomings were being communicated to PTV. “I think a lot of the [Regional Network Development Plan] feedback locally has been about trains rather than buses,” he said. “I think there were a lot of concerns about the single track between Bunyip and Longwarry and being on time, but I don’t know how much feedback there was about the buses. A spokesperson for local Labor MP Harriet Shing said an expansion of services was being considered as part of PTV’s review. “Expanding the delivery and frequency of bus services for West Gippsland is being considered as part of the Regional Network Development Plan – Victoria’s first ever short, medium and long-term plan for better regional public transport,” the spokesperson told WBBC. “The plan that had come out of then-public transport minister Terry Mulder’s office was a staged process, with a review of services after we saw how the precinct redevelopment performed,” the spokesperson told the Warragul & Baw Baw Citizen. “There was no point establishing bus services before we knew how everything fitted together. Mr Chapman also questioned the main link between the new station car park and the station itself – a long ramp and bridge. He said it was long and difficult for older residents and a growing problem as the car park becomes increasingly full. Mr Blackwood’s spokesperson said the design was appropriate. “We definitely think the pedestrian ramp was the right option for the development of the Warragul Railway Station,” the spokesperson said. “Since the completion of the station precinct our office has only had one negative comment from the electorate about it being a walking overpass.